Rich creamy pumpkin pie in a cup is how I describe this dessert. With real pumpkin and a touch of vanilla, it's a perfect end to a light meal. The base is similar to a traditional pudding made with hot milk, cornstarch and spices. Here we use cream, pumpkin, spices, eggs, vanilla, sweetener and xanthan gum as the thickener in place of cornstarch. 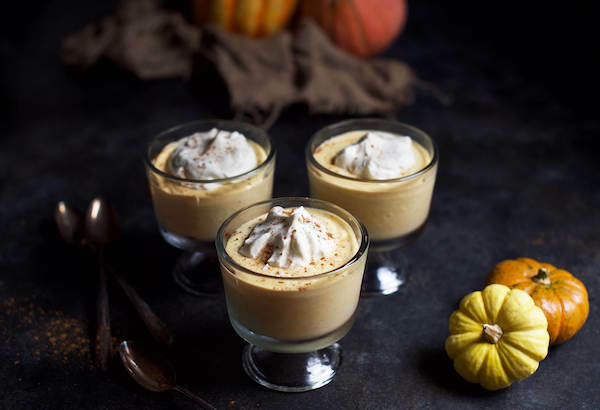 What makes this pudding so light is a mixture of whipping cream, sweetener, and vanilla that's folded into the chilled pumpkin mixture to create a fluffy body somewhat like a light mousse. You'll never go back to regular pudding again. Who thought that Keto desserts could be so sweet? In a medium saucepan combine the sweetener, xanthan gum, pumpkin spice, and salt with a whisk until smooth. Add pumpkin puree, yolks, and vanilla extract to the dry ingredients. Stir until thoroughly combined. Gradually add in the whipping cream, whisking between each addition. Once all of the cream has been added, bring the mixture to medium heat. Heat the pudding mixture, whisking constantly until the mixture thickens, about 4-7 minutes. When thickened, remove from heat and transfer into a bowl. Place the bowl in the fridge, removing to stir every 10 minutes. Transfer the pudding into small serving containers, cover, and then place in the fridge for at least 1-2 hours before serving.